I traveled down to Liverpool and the 2013 Sydney Model Railway Exhibition. Soon, I found the display by the Lego group and the two members manning it. I introduced myself and we spent the next hour or so talking pleasantly about Lego. That night when I got home, I emailed the group and they sent me a membership form to complete for the group to review and approve. I completed the form and returned it. Two weeks later, I became a member of the group. A few weeks later on a Sunday, I traveled to western Sydney where the group were holding their last meeting for 2013 combined with a Christmas party. It was good fun, and interesting. What was very interesting was that not only were most of the members parents, but that in most cases both partners were active builders. Some had been all of their lives, while some had rediscovered the joys of Lego after their children had discovered it. Age-wise, there was a broad range that I guestimated my early-40s self was in the middle of. Several hours passed until we finally called it a day. We weren’t due to meet again in person until some time in early 2014, but until then we could keep in touch via a Yahoo! group. As well, I could keep on building. And I did, both at home and away. A few weeks after the meeting, I was staying in Queensland with family for Christmas holidays. 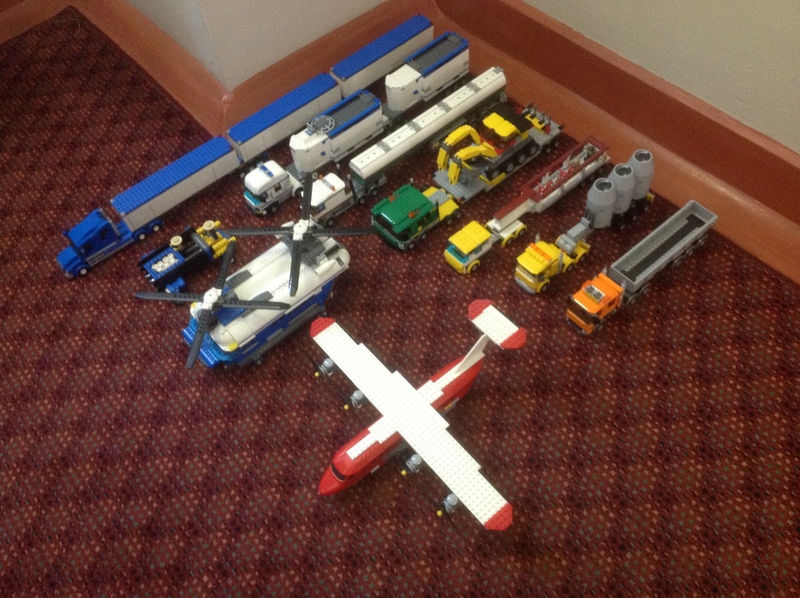 One day on impulse, I decided to take advantage of a pre-Christmas sale and bought three Lego trucks to once again combine into a larger one. And as 2013 became 2014, I not only continued building but embraced another associated activity. As part of my membership application, I was asked to provide photographs of my work. I did this via rudimentary iPad photos. Until then, I had never had much interest in photography…but as I continued building, I came to appreciate it a lot more, and not only just to record my creations. At first, as shown in the examples above, the backgrounds to my creations were the floor, the steps to the next storey and the small shelf unit next to my desk that I would also bring out into the hall – but then I found that the long solid barrier on the nearby stair-landing was ideal as a ‘road’ for my long vehicles. Soon, I saw that the metal railing that runs a few centimetres above the top of the barrier reminded me of a pipeline. Thus, the barrier and railing eventually became known in my mind as Pipeline Road. Much later into 2014, as some of my vehicles became more complex, I also created story lines and diorama photos to explain them. Taking photos of my creations has become a creative and enjoyable part of my building in itself. As early 2014 moved along and I continued to build and participate in the group’s Yahoo! discussions, I wondered about the next step in my Lego hobby: displaying at conventions and exhibitions. In March, I would get my first chance. This entry was posted in Gratitude, Happiness, Inspiration, Life Strategies. Bookmark the permalink.